It's also a "hunter's moon," and there's a rocket launch, because space is awesome. This weekend, space is going to be extremely lit — mostly by the giant supermoon dominating the night sky. You’ll be able to get your best look at the big, bright supermoon on both Saturday and Sunday nights, which will rise early and light up the sky with red and orange hues. This weekend’s supermoon is the first of three supermoons that will close out 2016. It’s also this year’s “hunter’s moon,” the next full moon after the autumn equinox’s “harvest moon.” Supermoons occur when the moon is full and within 90 percent of its closest point to Earth. Sunday’s supermoon will be close, but it won’t be the closest one this year. The biggest supermoon of 2016 will rise on November 14, and will be followed by another (slightly inferior) supermoon in December. As with any supermoon, it may seem a little bit brighter, but it’s not going to seem any bigger to the naked eye (unless you’re an experienced observer). The moon will look bigger when it’s closer to the horizon, as it does every month. The most noticeable effect of a supermoon is slightly higher tides for a couple days after the moon has come closest to the Earth. It’ll also rise a little quicker than usual: The hunter’s moon rises about 30 minutes later each day for a few days before and after the full moon. Usually, the moon rises 50 minutes later every day. 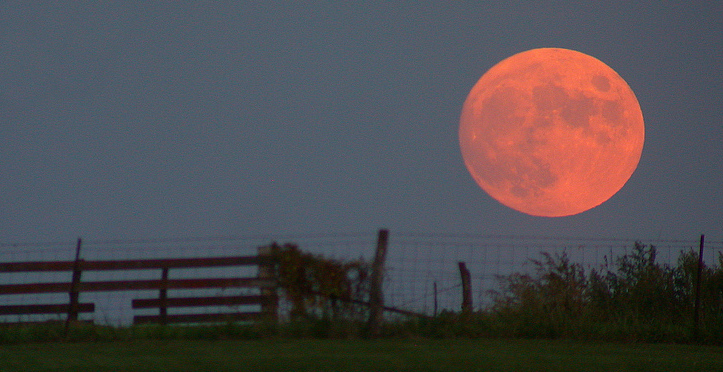 The color should be similar to this reddish harvest moon. The “hunter’s moon,” follows the harvest moon, signaling the time of year when hunting for winter storage should begin (and lighting the way for said hunting at night). The hunter’s moon also gives this month’s supermoon its reddish hues, which are caused by the thicker atmosphere near the edge of the horizon, as opposed to looking up into the night sky. If cloudy skies keep you inside, you can still watch Slooh’s live stream of the full moon with a roof over your head. While you’re outside looking up at the supermoon, keep an eye out for the Antares rocket launch on Sunday evening. Liftoff is scheduled for 8:03 p.m. ET.